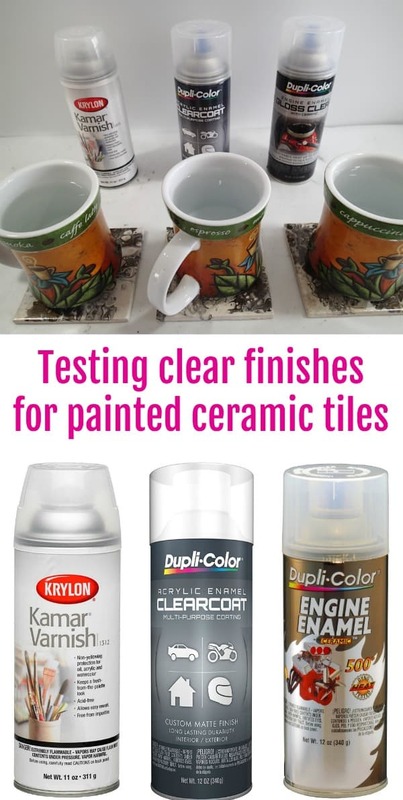 Another trip to scour the local stores this time to find more possible options for how to get a nice glossy seal on painted tiles that will stand up to the heat of a hot coffee mug. My local car part supplier yielded three possible spray finishes to try on my tiles. I am trying to find the perfect finish for the painted tiles that will turn them into functional coasters. My criteria – economical (rules out resin), ideally available on the island so it’s easy to get my hands on, glossy finish, easy to use, stands up to the heat of a hot coffee mug without going sticky. In this test, I used 3 previously painted ceramic tiles which had been left to fully cure for 1 month. I followed the instructions on the cans for how to use the paint – basically 2 light coats and then one wetter coat to finish. All tiles were then left for 7 days before carrying out the hot mug test. How did they get on – watch the video to find out! How does the brush on varnish react to the hot coffee mug test? Great video. Do you know what to look for from the UK? I can’t find that spray here ? some of the engine enamel products available on Amazon.co.uk say that it should be baked after it has dried to fully cure the finish. I wonder if that might be what was needed for the engine enamel (last one) that didn’t quite make the cup test? Thankyou soooo much for doing this, will try to get hold of this product!!!!!! Hello my question is which product would be the best for a trivet used for hot pan up too four hundred degrees. I don’t think any product would work well enough for this sort of heat. The heat would likely penetrate through to the acrylic paint underneath and I think could damage it, cause it to bubble or come away from the surface. I can’t be sure, I’ve never tried, but I’m not aware of anything I would trust to this sort of temperature. I’m curious, does the engine gloss state that it needs to be cured in a warm oven? Thank you for this video – very helpful! Not the one that I have, but I’ve read that of some of the other brands. It’s not something I would recommend because of the potential fumes in your home, and I’m no expert on that. Some people have a separate mini toaster oven and use it outside for crafts though. ah, just saw your reply to this one; same comment as mine that I have just made. I am not sure whether they would emit any fumes, I have used ceramic glazes that needed baking, and these didn’t emit any fumes. I have used the enamel clearcoat. After 10 days it still smells. Do you know how I can get rid of the smell? Hmm, well good news first that you have passed the hot mug test. About the smell though, not sure what to advise on that. I didn’t notice any smell but I’m not particularly sensitive to smells anyway. Maybe try wshing it in soapy water, but after that it might just be a case of waiting. Regarding the coasters, I use the Duplicolor engine enamel gloss clear. Three coats 24 hours apart then 24 hours later I bake them at 200 deg. Fahrenheit for 20 minutes and let them cool in the oven. My toaster oven is outside on the screened in porch. There is an odor. I’m going to try spray the three coats within the hour and bake 24 hours later. 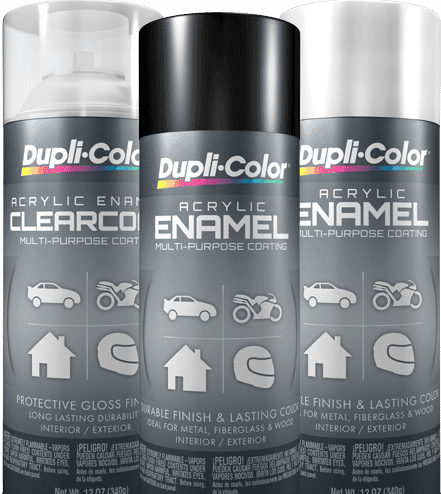 Is the Duplicolor scratch resistant? I’ve tried another engine enamel and it let my tiles get scratched. I’ve not used it long enough to be able to say. So far the ones I’ve done have been fine. Thanks so much for doing these tests deby. So just to confirm, if I buy the engine product that worked, I do not have to bake it. Right? I can’t bake anything as I don’t want to harm my kittens. I didn’t bake it, I wouldn’t in case of any fumes. However I have to say that others have since tested this product and some people say it still sticks for them unless they bake it. For the products that failed for me, some people say those products work perfectly for them and don’t stick. So unless you are using resin, there so far doesn’t seem to be any single product that has worked for everyone. Perhaps try a light sanding in between coats of the varnish. It’s something you would do when coating wood and I’ve done it with my alcohol ink pours. It would be something to test out to see if it makes a difference with the artifacts being left behind. Hi Christina, we haven’t tried that yet. I think a similar topic has been discussed in our Facebook Group, which you can find and join here if you aren’t already a member! Deby, have you tried these coatings on alcohol inks? We’ve tried Krylon Kamar Varnish Spray and Liquitex High Gloss Varnish, and both turned out great! Just keep in mind that the reaction to the inks varies depending on the surface you’re working with (ie. glass) so it’s best to do a test run on a small batch to see if doesn’t burn the alcohol out. Thanks for the tip, Karin! We’ll keep this in mind for our next projects. Thanks for doing this! So helpful, clear, and logically done… really appreciate!